All of the country's major regional barbecue styles come together at this casual Newport Beach waterfront joint. 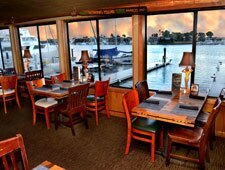 : This casual Newport Beach eatery is located right on the water along the Mariners Mile neighborhood, where it stands out amongst the yachts and upscale businesses in the area. The bar-like interior is a fun pastiche of pop culture and local history, as the walls are adorned with plenty of memorabilia of OC restaurants from bygone eras. It’s a good match for executive chef Kris Kirk's approachable food, although starters like the smoked duck and roasted shallot fries are a fancy touch. Tasty barbecue runs the gamut from daily smoked brisket to Texas-style beef short ribs, while the pizzas and juicy chicken give guests other solid entrée options. For dessert, we recommend the peanut butter and chocolate bread pudding served in a Mason jar. The beer selection is surprisingly slight, but there is a sturdy list of elegant and rough-and-tumble cocktails. On the weekends, guests can start the day by dropping in for breakfast and creating their own down-home country skillet with items ranging from assorted vegetables to interesting proteins like pulled pork and smoked salmon.